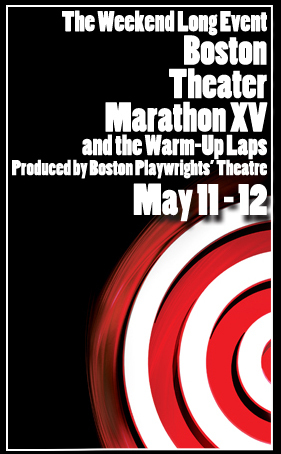 Boston Playwrights’ Theatre presents the 15th annual Boston Theater Marathon and the fifth year of The Warm-Up Laps on May 11 and 12 at the Stanford Calderwood Pavilion at the Boston Center for the Arts, 527 Tremont Street in Boston's South End. Taking place on May 12, The Boston Theater Marathon features 53 ten-minute plays, by 54 New England playwrights, produced by 53 New England theaters in 10 hours. A full schedule follows below. The Boston Theater Marathon has brought playwrights, directors and theaters together over the past 15 years in an effort to foster collaboration between artists and producers. Many playwrights have enjoyed full-length productions with collaborating theaters because of the relationship forged during the Boston Theater Marathon. On May 11, The Warm-Up Laps will feature "Windowmen" by Steven Barkhimer at 12 p.m. (sponsored by SpeakEasy Stage Company), "Shelter" by Miranda Craigwell at 2 p.m. (sponsored by Huntington Theatre Company), and "Widow’s Walk" by Deirdre Girard at 4 p.m. (sponsored by Company One). The Warm-Up Laps are presented in collaboration with The Boston Center for the Arts and their resident theaters in the Deane Rehearsal Hall at the Calderwood Pavilion and are free and open to the public. All net proceeds from ticket sales will benefit the Theatre Community Benevolent Fund which provides financial support to theaters and theatre artists in times of need. The plays The Boston Theater Marathon of are chosen from more than 400 entries from New England playwrights. The selected plays are produced by New England Theatre companies who donate their time to this event. Generously supported over the years by the Center for the Humanities at Boston University and by individual donations, the BTM gives net proceeds to the Theatre Community Benevolent Fund, an organization helping area theatre artists and companies in crisis. In 2009, thanks to a new association with the Boston Center for the Arts, the BTM expanded to include a Saturday of full-length play readings. In addition to its charitable goals, the BTM matches playwrights with theatre companies, introduces patrons to the diversity of Boston playwriting and the theatre scene, and provides a showcase for the entire theatre community. In 2000, the BTM received a special Elliot Norton Award from the Boston Theatre Critics Association for "Enlivening Local Theatre." Founded in 1981 at Boston University by Nobel Laureate Derek Walcott, Boston Playwrights' Theatre is an award-winning professional theatre dedicated to new works. Tickets to the Warm Up Laps are free; seating is limited and based upon availability. Tickets for the Marathon are $25 tickets in advance and $35 at the door. An all-day pass allows patrons to come and go as they please. For tickets or information, call 617-933-8600 or visit www.bostonplaywrights.org.